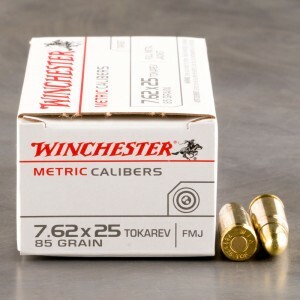 7.62 Tokarev ammunition, also known as the 7.62 Tok, or the 7.62 x 25mm is an extremely high velocity Eastern Bloc round. 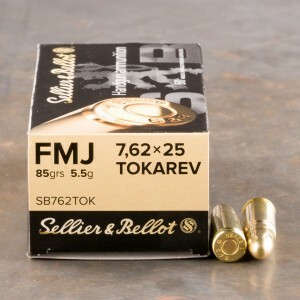 The 7.62 Tokarev cartridge was one of the fastest pistol cartridges produced in its time. The round was used widely in both pistols and sub-machine guns, and favored for its ability to penetrate barriers easier than both the European 9mm and the American 45 ACP. The 7.62 Tok round was also capable of penetrating early body armor, up to modern kevlar helmets. The Tok round was passed around freely among Eastern Bloc and communist nations, because of the Soviet Union’s lax lend/lease style programs. This rounds and the weapons that use it can be found in Europe, Eurasia, Asia, the Middle East, and South America. The round made its way to American shores after the Cold War ended.